This post is meant to augment the Kindle Free Edition of Oriental and Occidental Rugs Antique and Modern by Rosa Belle Holt with the illustrations of designs or motifs lacking in that free digital edition. I downloaded the freebie but discovered to my chagrin that it contained not a single illustration. Lots of great text, but text alone isn’t enough when the subject matter is a visual treat like oriental rugs. So I reached into my shallow pockets and came up with enough for a used hardcover edition. To my pleasure, I discovered that the illustrations listed in the Kindle Free Edition existed page by page in the hardcover. 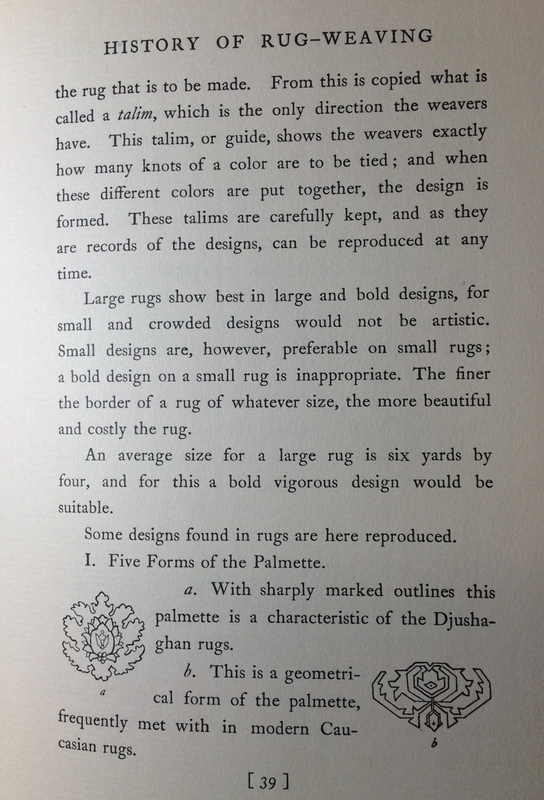 If you have the Kindle Free Edition, you will see that the chapter titled “Designs” on page 37 has a listing of designs or motifs found on oriental and occidental rugs. A listing but no illustrations. The hardcover edition has those illustrations, all apparently hand-drawn on five pages. I photographed them for your viewing pleasure. Even if you don’t own the free edition, I think you will find these pages interesting and well-worth reading. Keep in mind, Mrs Holt’s Oriental and Occidental Rugs Antique and Modern was among the first attempts at creating a reference manual for rug lovers and collectors.